This is an oatmeal cookie recipe with a delicious twist. This recipes not only has raisins it also has chocolate chips and walnuts too! Cream sugars, butter and coconut oil. Add eggs and vanilla, mix well. Combine flour, salt, cinnamon and soda. 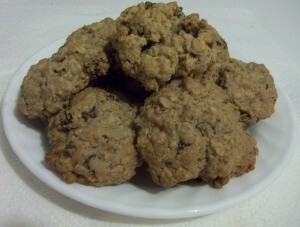 Mix well and add oats, raisins, nuts and chocolate chips, mixing well. Drop by rounded teaspoonfuls for small cookies (or tablespoonfuls for larger ones) on ungreased cookie sheets. These cookies do not spread. Bake 10 to 12 minutes or until golden brown in a 350 degree F oven. Cool for a minute then remove to wire racks. Oatmeal raisin cookies are my favorite. With chocolate chips? Heavenly! I am making these this week! Thank you for another great recipe.